et al. ; licensee BioMed Central Ltd.
cpyrt 2012collab Krueger et al; licensee BioMed Central Ltd.This is an Open Access article distributed under the terms of the Creative Commons Attribution License (http://creativecommons.org/licenses/by/2.0), which permits unrestricted use, distribution, and reproduction in any medium, provided the original work is properly cited. Kaposi’s sarcoma-associated herpesvirus (KSHV) encodes 12 viral microRNAs that are expressed during latency. Research into the function of these microRNAs has suffered from the lack of an experimental system that allows for the systematic removal of individual microRNAs. Here we have used the it E. coli Red recombination system in conjunction with a new bacmid background, 219BAC, generated in the Jung Lab to create mutants for every known KSHV microRNA. The specific microRNA deletions or mutations and the integrity of the viruses has been strictly quality controlled using PCR, restriction digestion and sequencing based assays. In addition, stable viral producer cell lines for wildtype, ΔmiR-K12-1, ΔmiR-K12-3, and ΔmiR-K12-11 have been created in iSLK cells generously provided by Don Ganem. Deep sequencing was employed to sequence verify all of the current producer cell line mutants and a qPCR assay was used to verify the expression of the remaining viral microRNAs. Creation of producer cell lines for all of the microRNA mutants is ongoing and these viruses will be made available to the research community for further study. This project was funded by ARRA RC2CA148407 to RR. POSTERPRESENTATION OpenAccessAcorelaboratoryforthegenerationofqualitycontrolledg-herpesvirusbacmids:generationof KSHVmicroRNAmutantsBrianKrueger,KarliePlaisance,RajnikumarSangani,CurtisLanier,VaibhavJain,JianhongHu,RolfRenne*From 13thInternationalConferenceonMalignanciesinAIDSandOtherAcquiredImmunodeficiencies (ICMAOI) Bethesda,MD,USA.7-8November2011Kaposi ssarcoma-associatedherpesvirus(KSHV)encodes 12viralmicroRNAsthatareexpressedduringlatency. ResearchintothefunctionofthesemicroRNAshassufferedfromthelackofanexperimentalsystemthatallows forthesystematicremovalofindividualmicroRNAs. Herewehaveusedthe E.coli Redrecombinationsystem inconjunctionwithanewbacmidbackground,219BAC, generatedintheJungLabtocreatemutantsforevery knownKSHVmicroRNA.ThespecificmicroRNAdeletionsormutationsandtheintegrityoftheviruseshas beenstrictlyqualitycontro lledusingPCR,restriction digestionandsequencingbasedassays.Inaddition,stable viralproducercelllinesforwildtype, miR-K12-1, miR-K12-3,and miR-K12-11havebeencreatedin iSLKcellsgenerouslyprovidedbyDonGanem.Deep sequencingwasemployedtosequenceverifyallofthe currentproducercelllinemutantsandaqPCRassaywas usedtoverifytheexpressionoftheremainingviral microRNAs.Creationofproducercelllinesforallofthe microRNAmutantsisongoingandtheseviruseswillbe madeavailabletotheresearchcommunityforfurther study. ThisprojectwasfundedbyARRARC2CA148407toRR.Published:19April2012doi:10.1186/1750-9378-7-S1-P27 Citethisarticleas: Krueger etal . 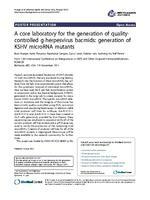 : Acorelaboratoryforthegeneration ofquality-controlledg-herpesvirusbacmids:generationofKSHV microRNAmutants. InfectiousAgentsandCancer 2012 7 (Suppl1):P27. Submit your next manuscript to BioMed Central and take full advantage of: Convenient online submission Thorough peer review No space constraints or color gure charges Immediate publication on acceptance Inclusion in PubMed, CAS, Scopus and Google Scholar Research which is freely available for redistribution Submit your manuscript at www.biomedcentral.com/submit *Correspondence:rrenne@ufl.edu DepartmentofMolecularGeneticsandMicrobiology,UniversityofFlorida, Gainesville,FL,USAKrueger etal InfectiousAgentsandCancer 2012, 7 (Suppl1):P27 http://www.infectagentscancer.com/content/7/S1/P27 2012Kruegeretal;licenseeBioMedCentralLtd.ThisisanOpenAccessarticledistributedunderthetermsoftheCreativeCommons AttributionLicense(http://creativecommons.org/licenses/by/2.0),whichpermitsunrestricteduse,distribution,andreproductionin anymedium,providedtheoriginalworkisproperlycited.